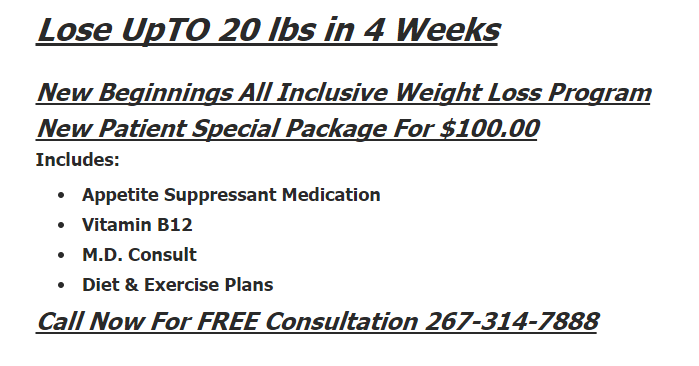 In our Medical Weight Loss Center in Philadelphia we believe that losing weight should be easy, fun and tasty. That is why we give our weight loss patient awesome recipes that taste great and will help burn body fat. If you are looking to lose weight try a few of these recipes. Bring water and 1 tsp vinegar to a light boil in a shallow pan. Make sure there is enough water to cover eggs. While water is coming to a boil, slice bagels in half and toast. Press garlic into oil and brush on cut side of toasted bagels. Garnish bagel with arugula and sliced tomato. To poach eggs, crack into water and cook about 5 minutes, just until the white is set and the yolk has filmed over. Remove with slotted spoon. Place on top of bagel and vegetables. Season with salt and pepper to taste. Serve open faced. Prepare pasta according to package directions. Toss pasta with remaining ingredients. Season with salt and ground black pepper. Heat 1 TBS broth in a 10-inch stainless steel skillet. Healthy Sauté onion over medium how heat 3 minutes, stirring frequently. Add garlic, mushrooms and continue to sauté for another 2 minutes. Add 1 TBS broth, tomato, salt, pepper and cook for another minute. Stir well, and gently scrape pan with a wooden spoon to remove any slight burning. Beat eggs well, and season with salt and pepper. Mix in chopped basil. Pour eggs over vegetables evenly and turn heat to low. Cover and cook for about 5 minutes, or until firm. Cut into wedges andserve. Lightly coat large baking dish with Crisco to makeclean up easy. Heat oven to 425. In a mixing bowl,stir sauce, water and pasta until well coated. Pour pasta & sauce into a baking dish. Cover with foil and bake for 30 minutes. Top with shredded cheese, return to oven for 10 minutes. Sprinkle with Parmesan and serve. Preheat broiler on high with rack in the middle of the oven, about 7 inches from the heat source. Place shallow metal ovenproof pan under the heat to get very hot for about 10 minutes. While pan is getting hot, rinse and spin dry salad greens along with basil and oregano leaves. For oregano, simply run your fingers down the stem to remove leaves and place whole in salad. When pan is hot, reduce heat to low, season chicken breasts with a little salt and pepper and place on hot pan skin side up. Return to broiler and cook for about 15 minutes, or until done, depending on the thickness of the breasts. The breasts cook fast because they are cooking on both sides at the same time. This is our Quick Broil cooking method. When chicken is just about done, remove skin and top breasts with a little gorgonzola cheese and return to broiler to melt. (If you’re not sure if chicken is done, make a little slice with a small sharp knife to check. It should be only slightly pink. Toss greens with lemon juice, olive oil, salt and pepper. Distribute greens onto 4 plates. Place chicken breasts on top of greens. Serve. Dissolve bouillon in 1/4 cup water in a small bowl. Stir in soy sauce, wine, cornstarch, ginger, and pepper. Heat vegetable oil in a large, nonstick skillet over medium-high heat. Add beef and garlic; cook, stirring constantly, for 3 to 4 minutes or until beef is no longer pink. Remove from skillet. to skillet; stir in bouillon mixture and green onions. Cook, stirring frequently, for 2 to 3 minutes or until sauce is thickened. Serve over rice. Heat 1 TBS broth in medium soup pot. Healthy Sauté onion in broth over medium heat for about 5 minutes, stirring frequently, until translucent. Add garlic, ginger, and continue to sauté for another minute. Add turmeric, curry powder, and mix well. Add squash and broth, and mix. Bring to a boil on high heat. Once it comes to a boil reduce heat to medium low and simmer uncovered until squash is tender, about 10 minutes. Add red chili powder, mix in well and add broth, zucchini, collard greens and tomatoes. Cook for another 5 minutes and add beans, corn, green chili, oregano, and cumin. Bring to a boil on high heat. Once it begins to boil, reduce heat to medium low and simmer uncovered for 15 minutes longer. (Simmering uncovered enhances the flavor) Add chopped cilantro, pumpkin seeds, salt and pepper. Preheat oven to 450. Place the fish in a baking dish just large enough to hold them, and add remaining ingredients. Cover, and bake until done, about 15 minutes; don't overcook. Serve at once, pouring the pan juices over the fish.